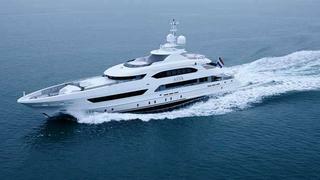 Heesen has delivered the 47 metre superyacht Asya to her owners. The full displacement superyacht was handed over on 3 March, following sea trials in the North Sea on 12 and 13 February. In relatively calm conditions, with average wave heights of 0.5m and southeasterly winds from four to 16 knots max, Asya exceeded the contractual speed by 0.8 knots. At her cruising speed (12 knots) she has a range of 4,000 nautical miles, powered by two MTU 8V 4000 M63 diesel engines. Heesen launched the 47 metre displacement superyacht Asya, previously known as Project He, in December 2014. Asya is the second in Heesen’s restyled 47 metre class, with exterior design by Frank Laupman of Omega Architects combining traditional lines with contemporary styling. The restyling of the 47 metre platform includes a significant change to the housing of the rescue tender in an enclosed bay in front of the wheelhouse, giving the forward section a cleaner look. Another design change concerned the crew accommodation, so that it complied with the necessary regulations. Heesen said the guiding princicple of the yacht's interior design was simplicity as the ultimate form of sophistication, with London-based and award-winning studio Bannenberg & Rowell taking care of interior styling duties. The boat has a Far Eastern, restful feel, Heesen says, inspired by the designs of Dieter Rams, Frank Lloyd-Wright and Tadao Ando. Heesen has nine yachts are currently under construction with deliveries scheduled through to 2017.